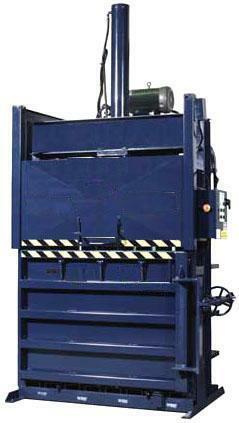 Balers are used to compress recyclable and waste materials into small, manageable bales. Balers are used in many industries such as manufacturing, schools, retail outlets, recycling facilities, and other businesses. Materials such as cardboard, textiles, foam, plastics, cans and bottles are compressed in balers and then baled for transport to a garbage or recycling facility. Any situation where there is a need for a baler or compactor that is small, easy to operate, produces very small bales that are light weight and easy to handle. Basically these are machines that have refrigerator style doors with push button type controls that have a mix of features found on both balers and compactors. Typical Bale Sizes and Weights: These balers typically generate bale sizes up to 15 Cubic Feet that range up to approximately 175 pounds (depending upon baled material). They are small enough to be fairly portable when ordered with casters. Primary Material Uses: Corrugated Cardboard, Plastics, Paper, Jugs, and Aluminium. The Mini-Baler Space Saver is ideal for.. Very small footprint requirements, as well as small, easy to handle bales and easy operation. Typical Bale Sizes and Weights: These balers typically generate bale sizes up to 9 Cubic Feet that range from 65 lbs - 90 lbs for cardboard and 85 lbs - 110 lbs of plastic film or plastic bags. They are also easy to move around compared to other balers. In addition, you can add either the High Density Package with bale weights up to 110 Cardboard and 155 Plastic Film or the Extra High Density Package with bale weights up to 132 lbs of cardboard and 176 lbs of plastic film. 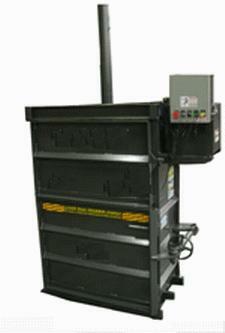 Balers - 30" Vertical Balers are ideal for.. Convenience Stores, Drug Stores, Hospitals, Restaurants, Nursing Homes, Retirement Homes, Offices, Utility Rooms, Hotels, Motels, Textile, and many other applications. Typical Bale Sizes and Weights: These balers typically generate bale sizes of 10 - 12 Cubic Feet that range up to approximately 250 pounds (depending upon baled material). They are small enough to be fairly portable when ordered with casters. Primary Material Uses: Corrugated Cardboard, Paper, Clothing, Newspaper, Plastic, Aluminium, Non-Ferrous Metals. Department Stores, Convenience Stores, Hospitals & Nursing Homes, Restaurants, Hotels & Motels, Office Complexes, and many other types of applications. Typical Bale Sizes and Weights: These balers typically generate bale sizes of 15 Cubic Feet that range up to approximately 250 pounds (depending upon baled material). They are small enough to be fairly portable when ordered with casters. Primary Material Uses: Corrugated Cardboard, Shrink Wrap, Office Paper, Clothes. Typical Bale Sizes and Weights: These balers typically generate bale sizes of 15 - 17 Cubic Feet that range up to approximately 300 pounds (depending upon baled material). They are small enough to be fairly portable when ordered with casters. Primary Material Uses: Corrugated Cardboard, Clothing, PET Plastic, Aluminium Cans, Steel Cans, Shrink Wrap. Supermarkets, Department Stores, Manufacturing Facilities, Shopping Centers, Colleges & Universities, Hotels & Motels, Recycling Centers and many other types of applications. Typical Bale Sizes and Weights: These balers typically generate bale sizes of 25 - 40 Cubic Feet that range up to approximately 1,100 pounds (depending upon baled material). Manufacturing Facilities, Warehouses, Department Stores, Shopping Centers, Supermarkets, Recycling Centers, Hotels & Motels, Hospitals & Health Care Facilities, Transfer Stations, Military Bases and many other types of industrial and commercial locations. Typical Bale Sizes and Weights: These balers typically generate bale sizes of about 50 Cubic Feet that can range up to approximately 2,000 pounds (depending upon baled material). Primary Material Uses: Corrugated Cardboard, Core Tubes, PET Plastic, Scrap Metal, Aluminium Siding and Cans including Food Cans, Stainless Steel, Radiators, Steel Cans, Newspaper, Foam, Shrink Wrap and Textiles. Typical Bale Sizes and Weights: These balers typically generate bale sizes of about 60 - 90 Cubic Feet that can range up to approximately 2,000 pounds (depending upon baled material). Primary Material Uses: Corrugated Cardboard, PET Plastic, Newspaper, Foam, Shrink Wrap, Waste Paper, Steel & Aluminium Cans. Typical Bale Sizes and Weights: These balers typically generate bale sizes of about 200 Cubic Feet that can range up to approximately 2,000 pounds (depending upon baled material). 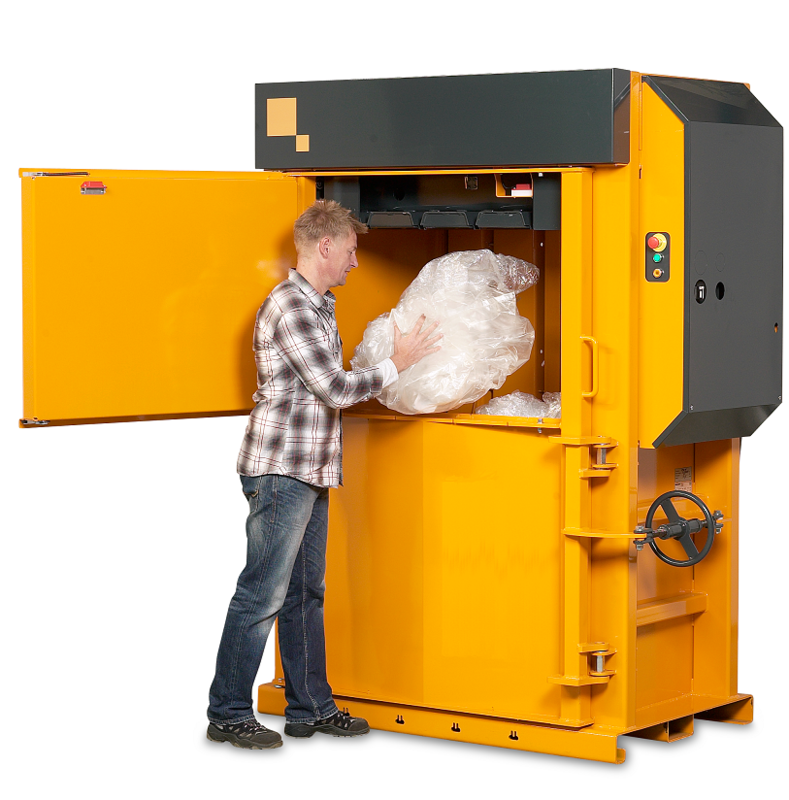 This Extra Low Profile Multi-Purpose Baler is ideal for..
Any applications where there is only a ceiling height of 8 feet and there is a requirement for low noise.. Typical Bale Sizes and Weights: These balers typically generate bale sizes up to 34 Cubic Feet that range from 775 lbs -1000 lbs for plastic wrap; 600 - 775 lbs for cardboard; 270 - 360 lbs for PET and Aluminum Cans and 500 - 1,200 lbs for clothes. 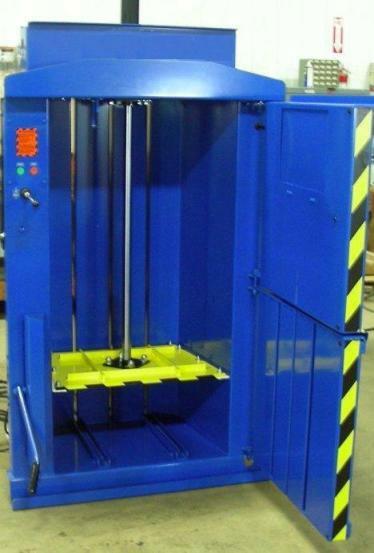 They are equipped with automatic ejection system so there is no need to go behind the machine since all stapping can be done from the front, which also means the balers can be placed up against the wall on the backside. . In addition, these balers incorporate a modem system that allows for remote diagnostics which offer the potential; for less down time. 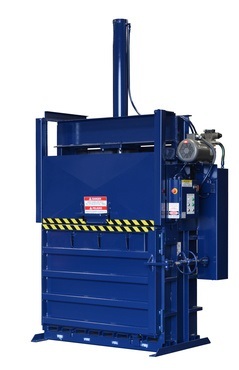 Closed End Horizontal Balers are Ideal for.. Municipalities, Distribution Centers, Manufacturing Facilities, Warehouses, Scrap Yards, Recycling Centers, Shopping Centers, Transfer Stations and many other types of applications. Typical Bale Sizes and Weights: These balers typically generate bale sizes of 40 - 70 Cubic Feet that range up to approximately 2,000 pounds (depending upon baled material). 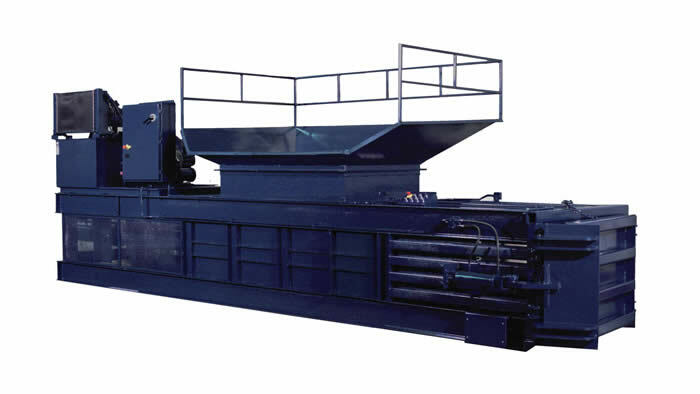 Best Use: The best use of Closed End Horizontal Balers is typically applications involving a continuous feed either by hand, loader, conveyor belt or air system. They are best suited for applications of up to 20 tons (OCC) per (typical) work shift. Typical Bale Sizes and Weights: These balers typically generate bale sizes of 50 - 80 Cubic Feet that range up to approximately 2,000 pounds (depending upon baled material). 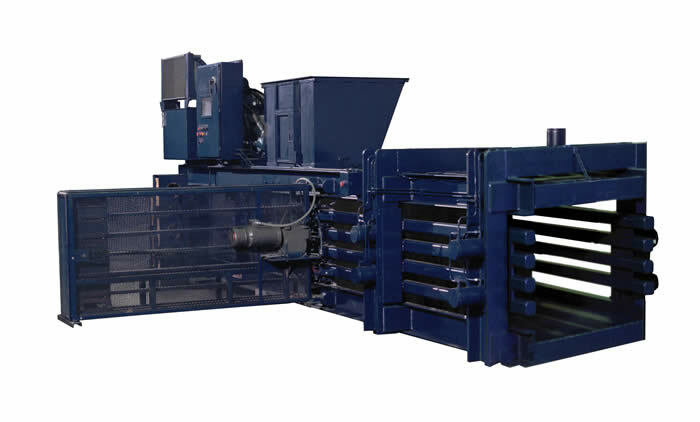 Best Use: Typically, the best use and purpose of Open End Horizontal Balers is very high volume, continuous applications utilizing Auto-Tie capabilities for producing up to 25 tons per hour. Typical Bale Sizes and Weights: These balers typically generate bale sizes of roughly 50 Cubic Feet that range up to approximately 2,000 pounds (depending upon baled material). 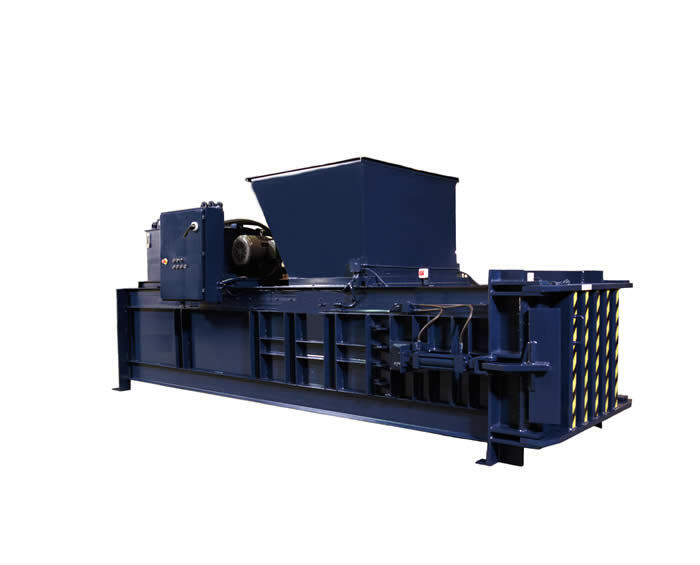 Best Use: Typically, the best use and purpose of Full Eject Horizontal Balers is very high volume, multi-material applications. 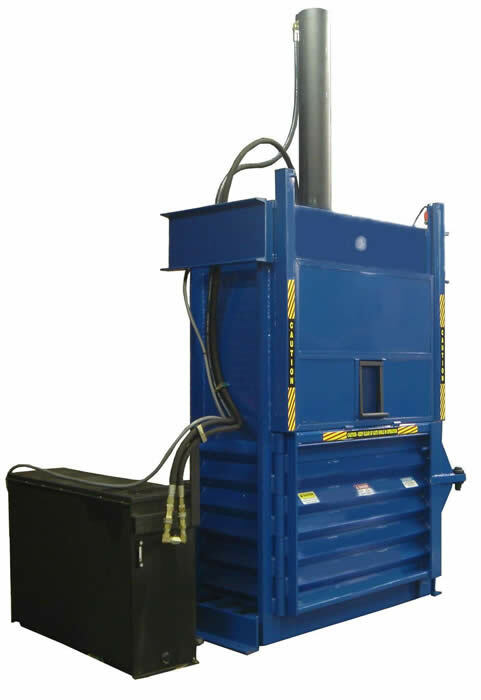 For recyclables, Waste Balers (or Recycling Balers) can not only help streamline waste processing routines related to labor and overall productivity but (since the recyclables are being removed from the waste stream) they can also eliminate a large amount of waste hauling requirements. 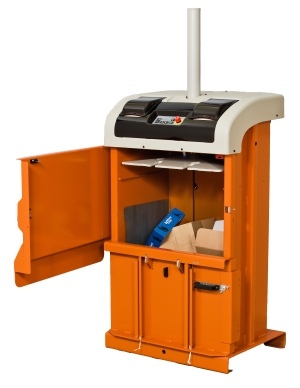 Waste / Recycling Balers can be the driving force for huge reductions in waste processing and waste disposal requirements, which means quick paybacks that can be as little as one year or less. Some of the less obvious benefits are improved housekeeping, fire hazard reductions and better overall sanitation due to trash being contained and under control. 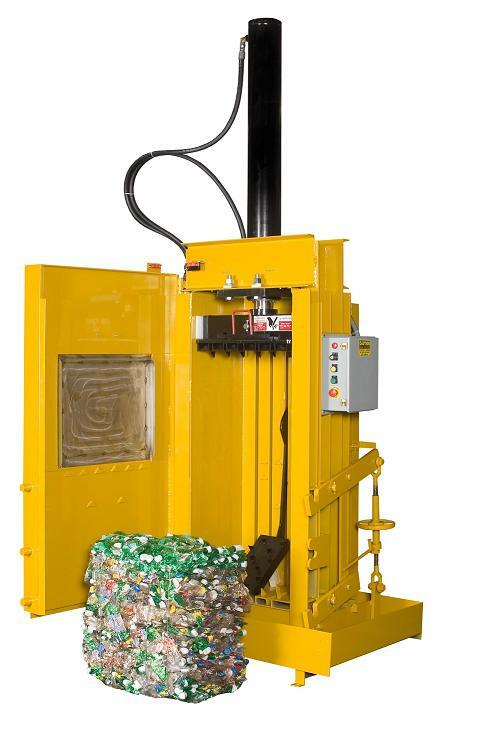 To learn more about Balers and Recycling, it may be helpful to read our General Overview.